First-Year Writing Programs face the challenge of teaching more linguistically diverse students with instructors who are far more transient than ever before. 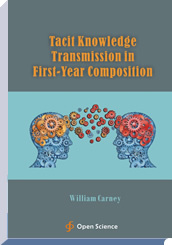 Graduate students, adjuncts, and an increasingly mobile workforce make the collection and transmission of tacit knowledge ever more important for those who teach freshman writing courses. This book provides a case study of how one university attempted to do just that and discusses how other institutions might engage in knowledge management. William Carney is Director of Freshman Composition at Cameron University in Oklahoma. He holds a doctorate from Texas Tech University and Master’s degrees from Stevens Institute of Technology and the University of Texas-San Antonio. Dr. Carney has published in a number of journals including the Journal of Language Teaching and Research, Community Literacy Journal, and the Journal of American Culture. His research interests include pedagogy, second language learning, internships and service learning, and public discourse.